An Egyptian Pony, “Whisperer” with two Irish Terriers and a goat in a landscape by a stream in an Irish landscape. Oil painting on canvas 28 x 36 inches in a giltwood frame. John Ferneley was born at Thrussington in Leicestershire, in the midst of the English Hunting Shires. 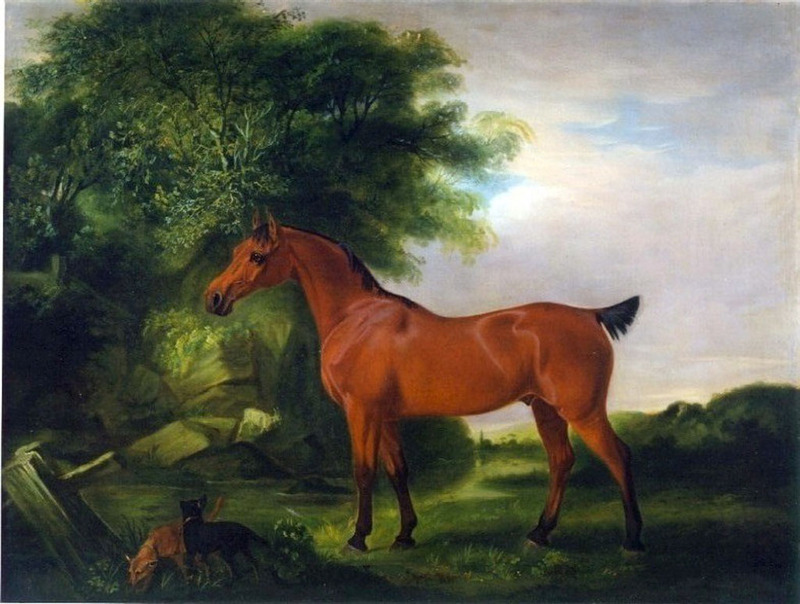 His precocity attracted the attention of the Duke of Rutland, who persuaded his wheelwright father to apprentice him to the great Sporting Painter Ben Marshall. The latter became a life-long friend as well as teacher. Little of Ben Marshall's broad and vigorous technique is evident in his pupil's later free and refined style, though some of Ferneley's early works, such as those painted on his visits to Ireland between 1808 and 1812 have echoes of his Master. This is apparent in the present painting. Ferneley rapidly established a distinguished English and Scottish clientèle, and he and Herring were the Sporting Painters par excellence in the period 1820-1850. Ferneley was himself a keen sportsman, and he tells us in his (eccentrically spelled) surviving letters of his exploits in the field. Throughout most of his working life he kept a meticulous Book of Accounts, which enable the vast majority of his work to be traced and identified. This makes him the best-documented - not to say one of the most satisfying - Sporting Artists in the heyday of hunting. He died on June 3rd 1860, and was buried at Thrussington. His sons, John Jr and Claude Lorraine, were competent sporting painters, though not in the same exalted class as their father.